I had a Surf and Turf dinner tonight. The Surf was Gorton’s Grilled Shrimp that I baked and the Turf was the leftover Flat Iron Steak from the Grilled Steak, Portobello and Green Bean Salad dinner from the other night. Just a reminder that marinade from that dinner is incredible! You can find the recipe for it from that dinner post from earlier this week. back to the Shrimp I used Gorton’s Classic Grilled Shrimp with Herbs and Spices. 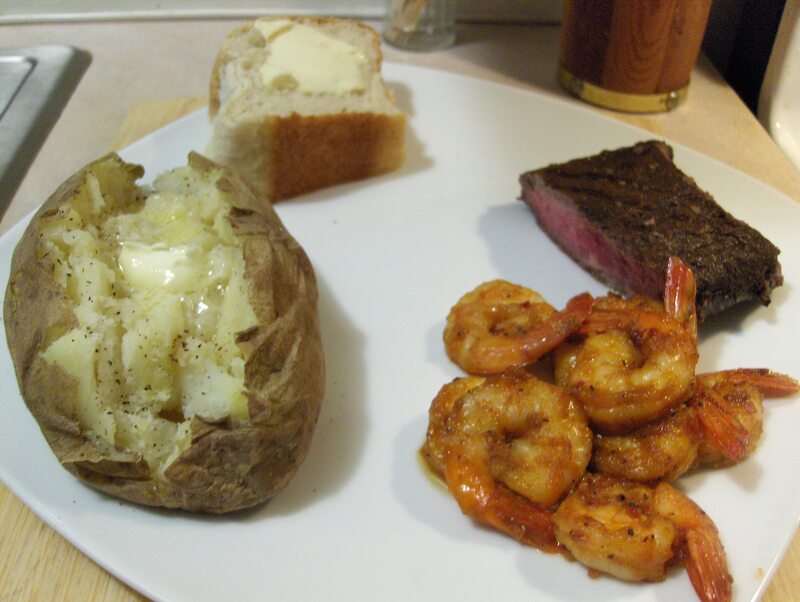 Easily fixed, bake at 425 degrees for 10 – 11 minutes and you have Shrimp! There’s 8 Shrimp per serving and it’s only 110 calories and 5 carbs. As I said the Steak was leftover from the other night. I had a medium sized Baked Potato and French Bread as sides. The French Bread was something new I tried, Pillsbury Simply Rustic French Bread. I normally try to stick to Whole Grain and Low carb Breads but this looked so good I had to give it a try. It was as good as it looked! Just open up the can and bake it at 350 degrees for 23 minutes and you have a delicious loaf of piping hot bread. For dessert later a Yoplait Delight Chocolate Eclair Parfait. I seen this on an episode of Healthy Appetite with Ellie Krieger and gave it try for dinner tonight. I used a Fla t Iron Steak and used a cast iron grill pan to prepare the Steak and Mushrooms. The recipe called for a 1/2 a Red Onion, I only used a 1/4 Red Onion and not a huge Tomato fan so I omitted the Tomatoes. The recipe and directions are at the bottom of the post. Everything turned out delicious! The Balsamic Vinegar along with the other dressing ingredients make a fantastic dressing and provides a real kick to the Steak and Green Beans. Plus it’s only 410 calories and 25 carbs! Combine 2 tablespoons olive oil, 3 tablespoons balsamic vinegar, orange juice, 2 teaspoons minced garlic, chili flakes, and 1/4 teaspoon each salt and pepper in a bowl and whisk. Place steak and mushrooms in a glass baking dish or sealable plastic bag and pour marinade on top. Marinate in the refrigerator for at least 1 or up to 4 hours. Combine remaining 2 tablespoons olive oil, 3 tablespoons vinegar, 1 teaspoon minced garlic, water, mustard, and remaining 1/4 teaspoon each salt and pepper. Whisk until incorporated. Place green beans in a steamer basket over a few inches of boiling water and steam until tender-crisp, about 3 minutes. Allow to cool in the refrigerator, or to cool quickly, drain and plunge in a bowl of ice water for 2 minutes. Drain and reserve. Spray a grill or grill pan with nonstick cooking spray and heat over medium-high heat. Remove steak and mushrooms from marinade, and discard marinade. Grill steak until medium-rare and mushrooms until cooked through but still juicy, about 4 to 5 minutes per side for both steak and mushrooms. Remove to a cutting board and let rest about 10 minutes. Cut steak across the grain into 1/4-inch slices; cut mushrooms into 1/4-inch slices. 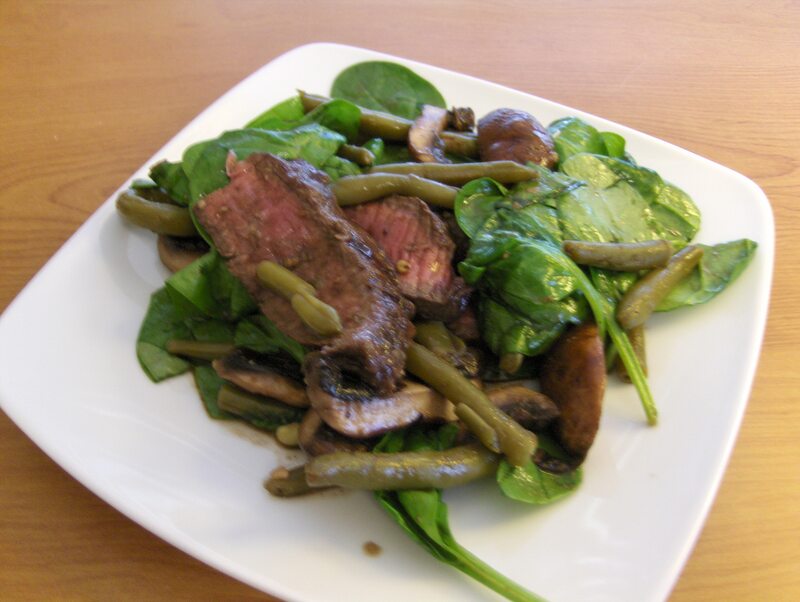 To assemble salad, toss steak slices, mushroom slices, spinach leaves, tomatoes, green beans and onions with dressing. Divide among 4 plates. The Jazz & Rib Fest is a highly anticipated summertime tradition offering both jazz and rib connoisseurs the finest in music and barbeque for more than thirty years. Building off the success of our move to the premier entertainment destinatio n of downtown Columbus, we are thrilled to once again call The Arena District the home of hot ribs and cool jazz. McFerson Commons and North Bank Park stages will anchor the event with performances featuring the best regional and international jazz artists. The Jazz Café at North Bank Pavilion will showcase local artists on an intimate riverfront stage set against the city skyline. Award winning rib-burners representing 10 States and Canada will fire up their grills along Spring & Long Streets to compete for “Best Ribs” bragging rights. LOCATION: The Arena District: North Bank Park, McFerson Commons, and Spring & Long Streets in downtown Columbus, Ohio. Click here for more details on the location. PARKING: Surrounding areas of The Arena District. Click here for more details on where to park. All food vendors will be open from 11:00am—11:00pm on Friday and Saturday, and from 11:00am—8:30pm on Sunday. Food and concessions will be available during event hours only. Thank you Guy Fieri (Food Network), one delicious recipe! Found this recipe via Guy Fieri and it is a good one! I posted the original recipe at the end of the post. I made a few changes when I prepared the sauce to lighten it up a bit. I used Hellman’s Light Mayo and Reduced Fat Breakstone Sour Cream. I also used Healthy Life Sandwich Buns and I used a Flat Iron Steak instead of Top Round. I marinated and refrigerated the Flat Iron Steak yesterday at noon and removed it from the fridge about 30 minutes before grilling. The spices worked well with the Steak and then when grilling created a nice char on the outside and great flavor on the inside. What really set the sandwich off was the sauce, the recipe for this is also listed below. the sauce is also great on a Baked Potato. As a side I had a Baked Potato. For dessert later some more of the Breyer’s Carb Smart Chocolate Ice Cream. Combine seasoned salt, 1 tablespoon black pepper, onion and garlic powder, oregano, paprika and chili powder in a 1-gallon sealable plastic bag. Mix thoroughly and then add 1 piece of meat, shake it around in the bag, remove it and repeat with the second piece of meat. When both pieces are done, return them to the bag, and let marinate for 24 to 48 hours in refrigerator. Remove meat from refrigerator at least 20 minutes, prior to grilling. In a medium-sized bowl, combine the sour cream, mayonnaise, lemon juice, horseradish, garlic and sea salt and pepper. Mix thoroughly and place into refrigerator for at least 4 hours. Set grill or large grilling pan to high heat. Cook meat for 20 minutes or until desired temperature. Remove from heat, cover and let rest for 5 to 10 minutes. Best served medium-rare. Slice cooked and rested steaks paper thin using either a knife or counter-top deli-slicer. Place 4-ounces of meat on a slice of toasted rye and spread on sour cream horseradish. Today’s Menu: Flat Iron Steak w/ Green Beans and Whole Grain Bread. I wanted a light meal for tonight, because I have some blood work in the very early in the morning to check the sugar, tris, and Cholesterol and such. I had a 100 Calorie Flat iron Steak that I get from Walmart from time to time. They are great little Steaks at 100 calories and 3 carbs per Steak and come three to a package. I pan fried it in a half a tablespoon of Extra Virgin Olive Oil for 2 1/2 minutes per side and seasoned with McCormick Grinder Steakhouse Seasoning. As sides had Green Beans and Healthy Life Whole Grain Sliced Bread. For a snack/dessert later a 100 Calorie Bag of Jolly Time Popcorn. Low cal, low carb, great tasting equals a good and healthy lunch! Had a Steak and Bleu Cheese Salad. Used the 100 Calorie Flat Iron Steaks (we purchase from Wal Mart), Lettuce, and Litehouse Bleu Cheese and a tablespoon of Litehouse Chunky Bleu Cheese Dressing. Cooked the Steak on on a griddle and used Pam Spray w/ Olive Oil, using a griddle I cut out the calories of having to add any oil. Seasoned it with McCormick Steakhouse Grinder Seasoning. Quick, easy and healthy lunch! Today’s Menu: 100 Calorie Flat Iron Steak w/ Sauteed Mushrooms, Baked New Potato Wedges, and Harvest Grain Loaf Bread. Great tasting low carb and low cal dinner! Had a 100 calorie Flat Iron Steak, purchased from Wal-Mart, with Sauteed Portobello Mushrooms, Baked New Potato Wedges, and from the Kroger Bakery Harvest Grain Mini Loaf Bread. If you’re looking for a tender and tasty low calorie, low carb try these Flat Iron Steaks from Wal-Mart. They come 3 to a package and I highly recommend them.